← #Notbacktoschool, or How to Ease Back into Homeschooling after August is over! This podcast interview with the author of the book Keto for Cancer enlightens anyone who takes the time to listen. The author, Miriam Kalamian, has a son who at age 4 was diagnosed with a brain tumor. She serendipitously discovered the keto diet after seeing that months of chemo were not working for him. As a last resort, she put her son on the ketogenic diet. This is a diet that severely limits the amount of carbs in the diet. (Some people say that means 50 grams carbs, some say 20 grams.) In three months of eating this way, her son’s brain tumor shrank by 15%! Her son’s oncologist didn’t think it would help. She did it anyway, on what I think was her mother’s instinct. She went on to get a master’s degree in nutrition to research the chemistry behind this happening. She says that cancer feeds on sugar, so to starve cancer, it’s best to eat mostly fat. Read her son’s story here. Unfortunately, he did end up dying at age 13, from a large inoperable cyst that impinged on his brainstem. The ketogenic diet drastically improved his quality of life for the many years he was on it. 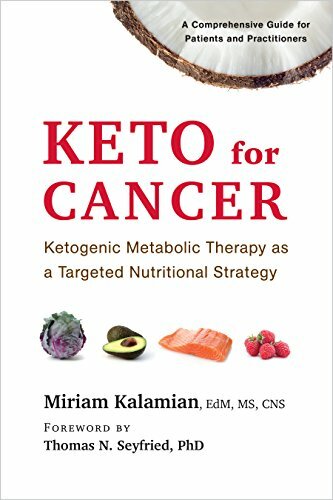 I hope anyway of you out there fighting cancer will get her book and pray to know if keto diet therapy is for you. Miriam’s web site is here for further information.